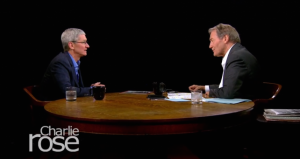 Shortly after participating in the large-scale announcements of the company in revealing the next generation of iPhones, Apple’s CEO Tim Cook has made a ‘rare TV interview appearance’ on PBS’ The Charlie Rose Show, and has started the first of a two-parter by announcing that Apple could yet pull out a new technological innovation of iPod or iPhone-esque proportions. While most of the world turns their head towards Google’s secretive ‘Google X Labs’ for the next big thing after a driverless car concept and Google Glass (amongst other ‘wearable technology’ markets that Apple is starting further back on), Cook claimed in the show that Apple have some secrets of their own. With the ‘second half’ of the differently-structured interview show set to broadcast on PBS tonight, will Cook offer any further hints as to what Apple’s next major product reveal could be all about, or has the company been overtaken for good in the innovation departments? The first part of the episode in question can be seen here. Apple CEO Tim Cook Constructs Cheaper iPhone Rumours?